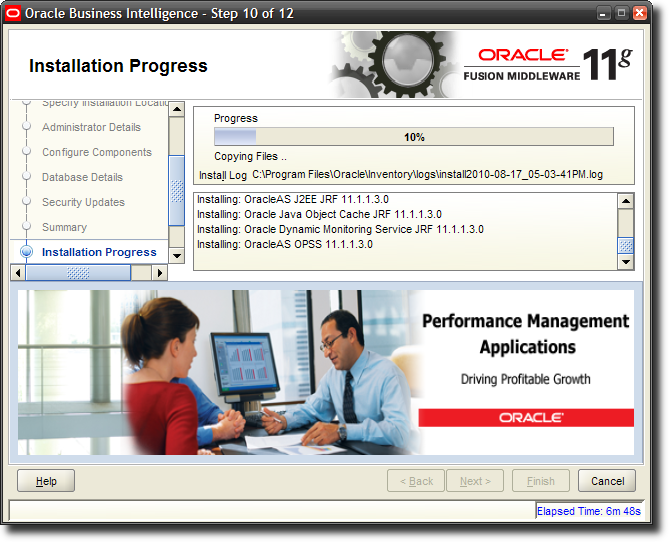 This launches the Oracle Universal Installer (OUI for short). 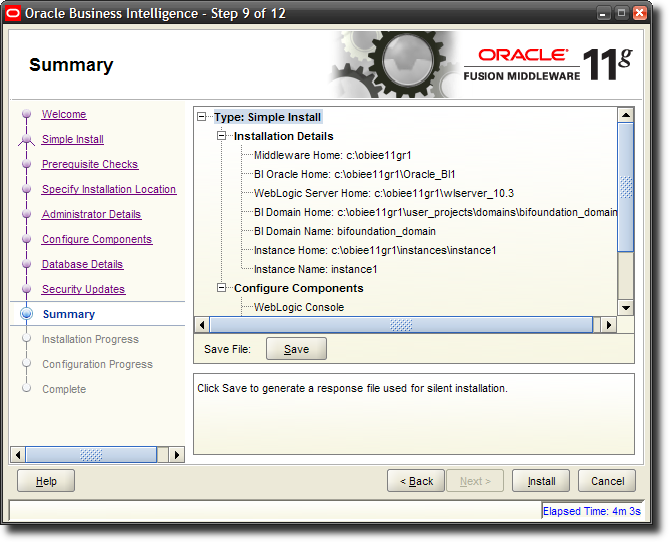 Don't get confused by the "Oracle Fusion Middleware 11g" logo at the top, since Oracle BI EE is part of the Fusion Middleware family of products. 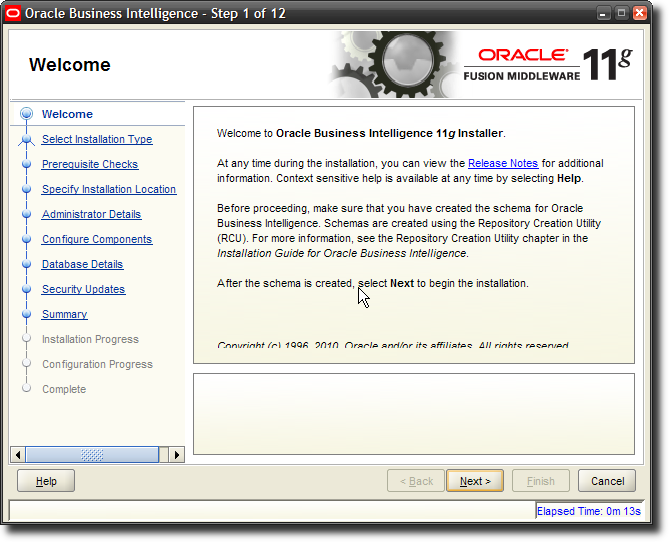 Since I am installing Oracle BI EE 11g on my laptop, I am going to go with the "Simple Install" option. The Middleware Home is going to be a new concept for people who have not installed Oracle products before. 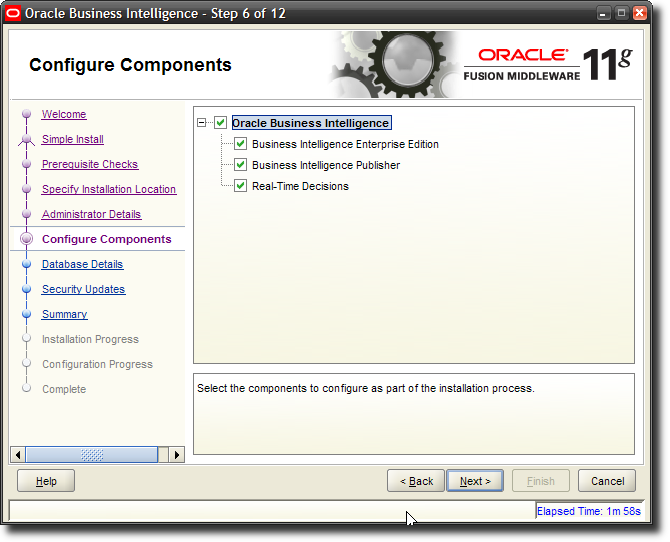 With this release, Oracle BI EE integrates more tightly with the Oracle way of installing products. 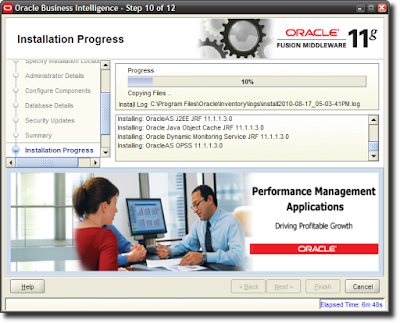 Every product needs to be installed into an "Oracle Home". 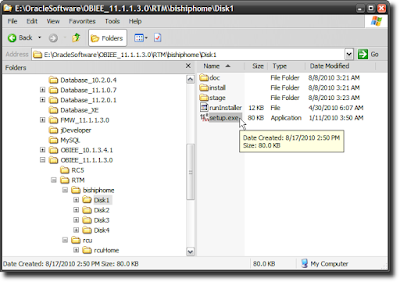 If you don't have an Oracle Home, you need to specify a new one. 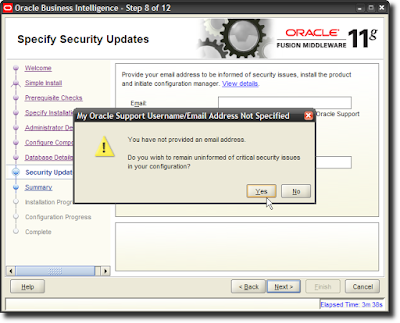 One thing that you will notice, which is different from other Oracle product installations, is that you do not get to specify a "name" for the Oracle Home. A system generated name is going to be assigned to this location that you specify as the Oracle Home. For the most part you do not need to concern yourself with its implications. You can enter any name here - like "weblogic" or "administrator" or "admin" or "abhinav" or "bigbaduser" - you get the general drift. 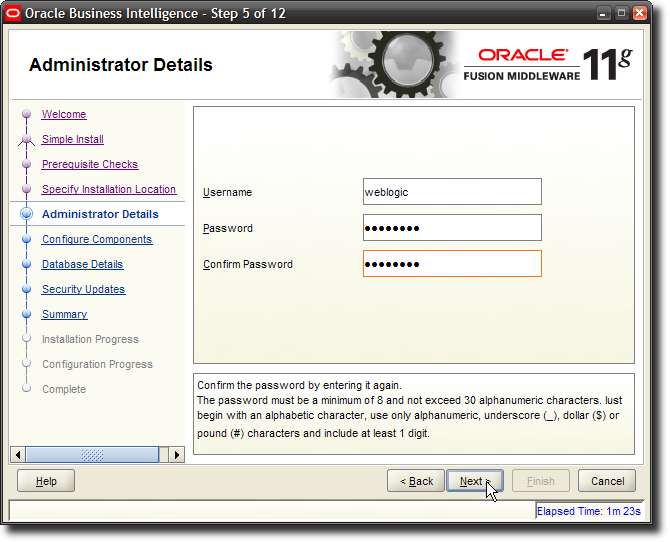 Enter a password, and make sure you remember it, since you will need this to log into the Console, BI EE, Enterprise Manager, and just about everywhere else. I will go with the default options selected - i.e. select all products on offer here. Remember my earlier post, The RCU And What It Means For You? 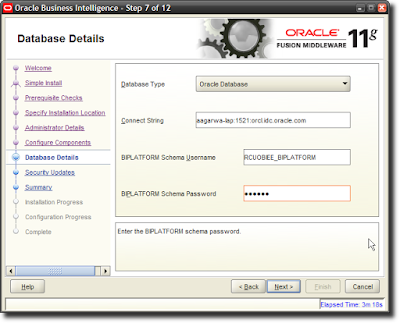 And remember the RCU schema name and password that you entered there? Well, you need that information here. 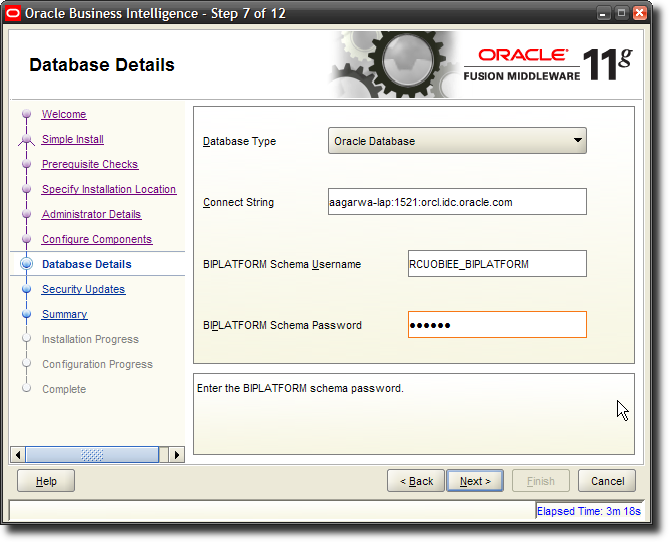 Based on what I entered when creating the schemas for OBIEE, I will enter RCUOBIEE_BIPLATFORM as the schema username, and the corresponding password. But what if you skipped the RCU step and directly came here, to the Oracle BI EE 11g installer? Not a problem. Leave this screen where it is. 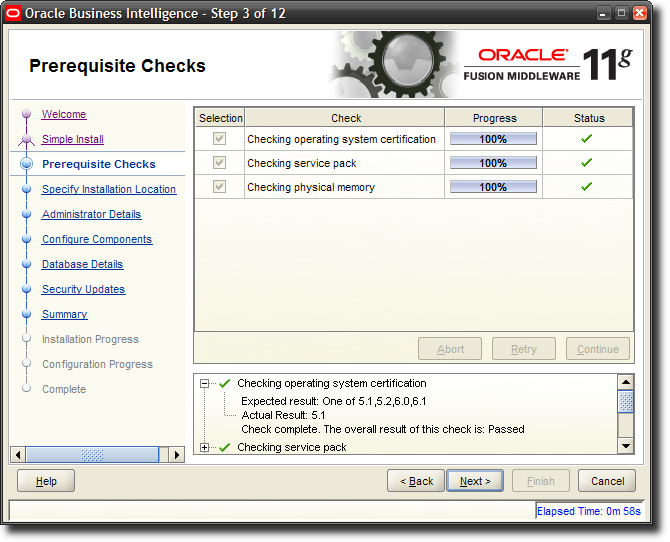 Go run the RCU installer, create the schemas for BI, and then come back to this screen. But either way, you do need those schemas. Yeah yeah yeah. So I choose to remain ignorant. 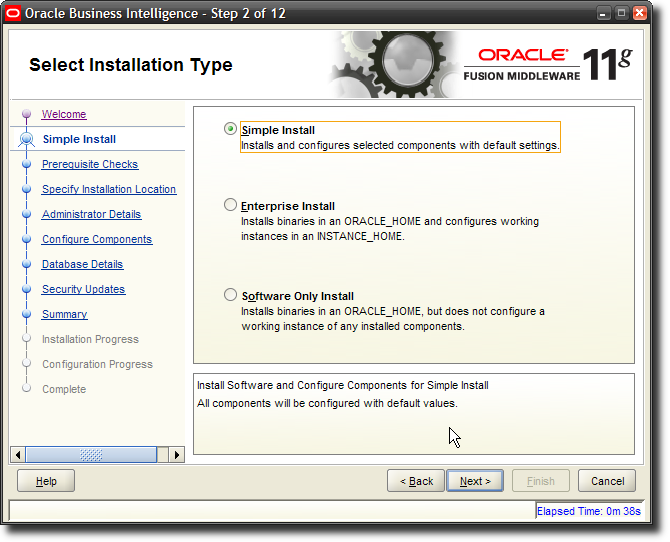 That's all as far as specifying options for the installer is concerned. The installer is now ready to do its stuff. You may want to save these details. Or not. Your choice. The installer doesn't take a whole lot of time on a server-class machine. On a hosted Linux box that I have access to, this installation process took less than half an hour, I think, or even less time. On a laptop, this is going to take longer. You need to be patient here. 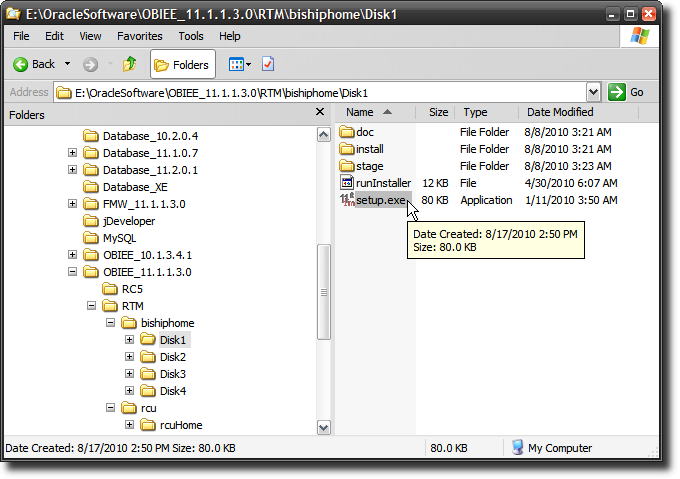 A laptop is not the best of choices when you want to run enterprise class software. But sometimes you have no choice. Like I don't have a choice. I am not going to lug a blade server with me, right? 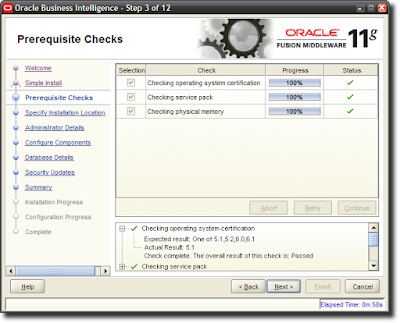 And I also need to run the Oracle Database 11g on the same machine. So that makes for more memory consumption, and more CPU usage. The good news is that RAM is cheap. As is hard disk. Of yes - if the configuration fails at some point, don't worry. At least initially. 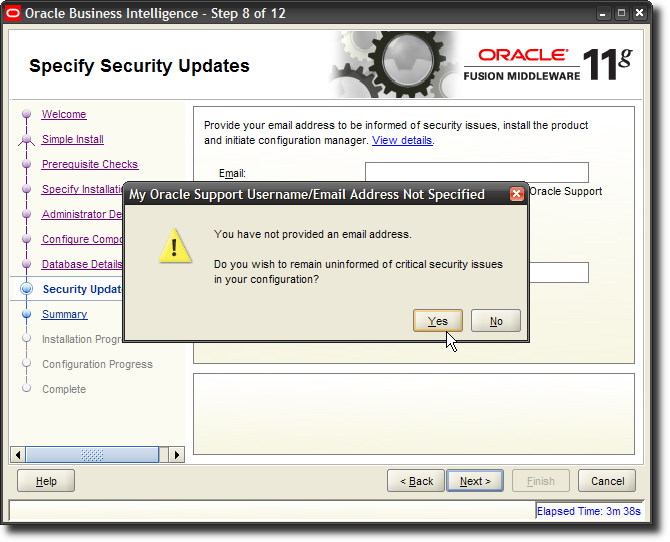 Click "Retry" and that should solve the problem. Most likely this is going to happen if the configuration step times out, which is likely if you are running this on a laptop machine. Once the configuration is completed successfully, you will notice the progress bar at 100%. That's good. 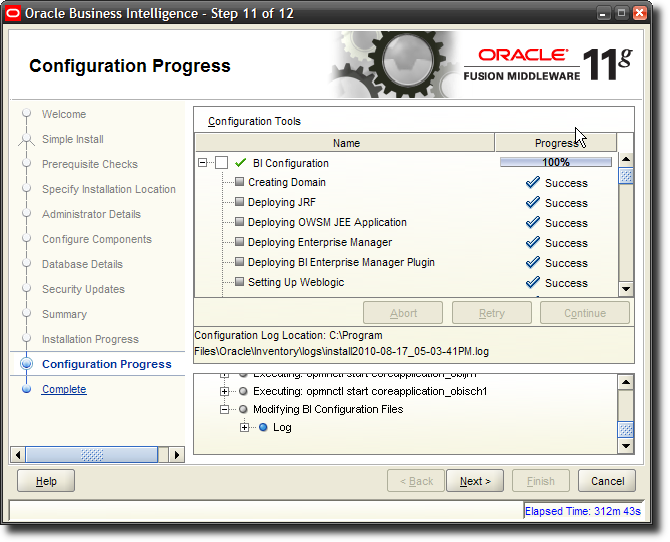 And every configuration step shows a status of "Success". That's also good. On this last screen, you will see details pertinent to your installation. It's a good idea to save these details someplace, for reference later. If you click "Finish" Oracle BI EE will open in a browser window.